Fred with multiple caps - which we're trying to identify. 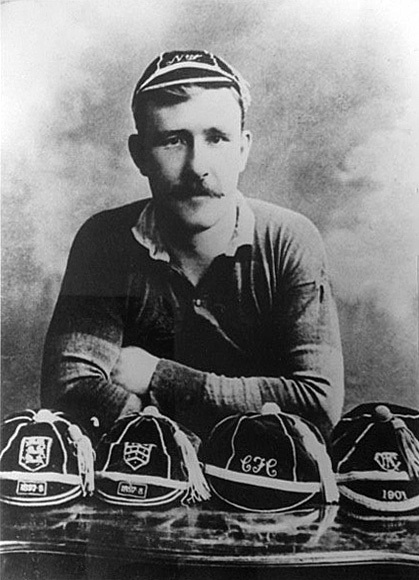 Fred was born in April 1874 in Gloucester, the son of a dock labourer. As a boy he lived at 20, Mill Street and then at 5, Old Row, Millbrook Street, Barton St Mary. In 1890, he signed up for seven years of active service in the Army followed by five years in the Army Reserve. He declared himself to be a labourer aged 18 yrs 2 mths, when in fact he was only 16 yrs 7 mths. At this time he was 5 ft 5 ½ ins tall and weighed 8 st 12 lbs, and described as of fresh complexion with grey eyes and brown hair. He served as a soldier in India, and remained in the Gloucestershire Regiment until 1897, when he returned to Gloucester, and worked for the County Council, although remaining in the Army Reserve. After that England trial, playing for the South against the North, and Fred’s marriage to Mary Keane in 1899 (they set up home at 3, Daventry Terrace, Brook Street, Gloucester), it must have felt as though everything was going Fred’s way. But his life was about to take a very different direction. He rejoined the Gloucestershire Regiment, and arrived in South Africa in January 1900. He was severely wounded at Dreifontein and later captured at Dewetsdorp, but was released, and discharged in November 1902. He remained in the Army Reserve until 1908. Fortunately he was able to resume for the 1903-04 season, and played in 27 of the Club’s 34 fixtures, scoring tries against Bristol and Northampton. WB recognised that amongst the forwards “Parham, Goulding, Hawker and Smith formed a strong quartette”. He also appeared for Gloucestershire against Somerset and Cornwall. 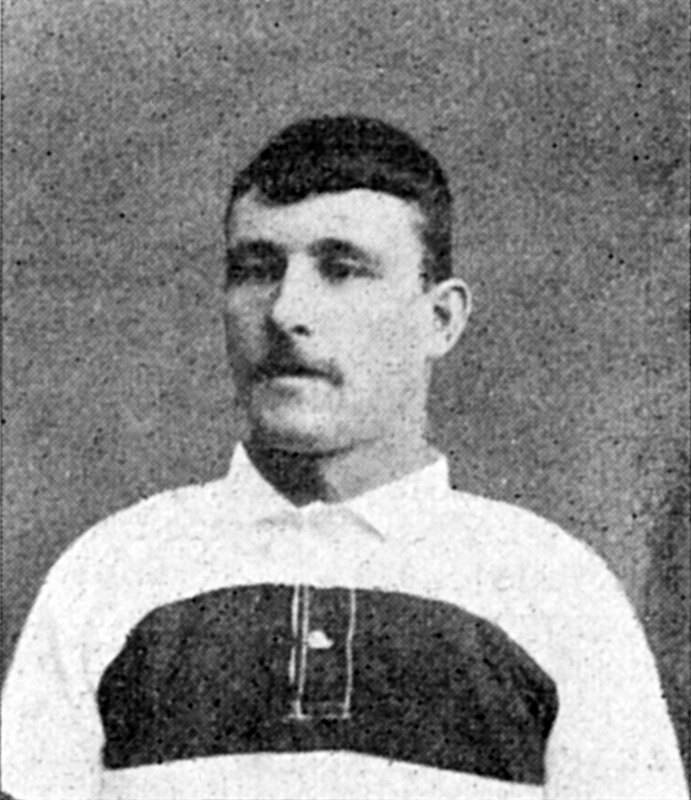 Fred turned out for a further 6 games in 1904-05, his last being against Cardiff on 5th November 1904, before he finally retired, having made 104 appearances and scored 9 tries for Gloucester. In 1909, his wife, Mary, died. In 1911 he remarried to Florence Beatrice Edmonds in Gloucester, but she too died in 1918 (of Spanish Flu, along with two of their children). In 1920 Fred married for a third time to Adeline Victoria Ethel Keates in Northwich. In August 1914, Fred was recalled to the Gloucestershire Regiment aged 40, when he was described as 5ft 9 ¾ ins, 12 st 4 lbs, with brown eyes and dark brown hair. He went to France in February 1915, was wounded in June, promoted to Lance Corporal in July, and sent to civilian work in a munitions factory in Northwich in 1916. Discharged from the Army in 1918, he remained in Northwich for the rest of his life, and died there in 1945, aged 71.